The balustrade leads to the front door of the church of SS Domenico e Sisto in Rome. 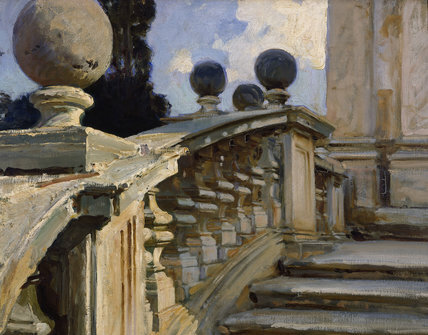 During his visits to Italy, Sargent sought relief from painting portraits and turned to landscapes, both in oils and watercolours. The artist described this as 'a study of a magnificent curved staircase and balustrade, leading to a grand façade that would reduce a millionaire to a worm'. He later used the study for the background to a portrait of Charles E. Eliot, President of Harvard University (Harvard).